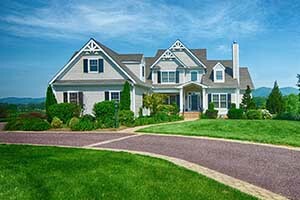 Some of the Beautiful Properties Sold by Gayle Harvey Real Estate, Inc.
Lovely eco-friendly farmhouse in Western Albemarle County with established gardens and orchards. 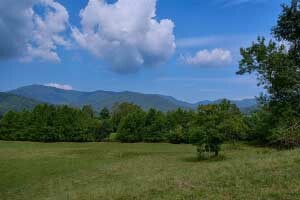 Great Blue Ridge Mountain views and convenient to the Rooute 151 Wine & Brew Trail. Property consists of three tax map parcels for a total of 31+/- acres. Sold! 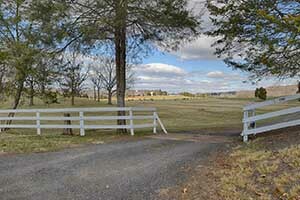 Beautiful Culpeper County Farm on 166+/- mostly open acres. Fences are in good condition and fields have been nicely maintained. Great investment potential with lots of road frontage. Just minutes from the town of Culpeper. 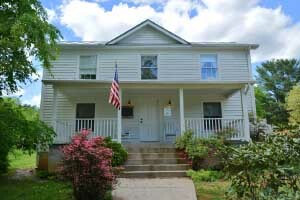 Lovely two bedroom, two bath home with fabulous mountain and river views for sale in Nelson County. Perfect for your retreat home! Sold! Enjoy the beautiful Blue Ridge Mountain views from nearly every room in this lovely home on 62+/- wooded acres in the Stony Point area of Albemarle County. Large first-floor master suite. Three en suite bedrooms on the second level. Finished walk-out terrace level and wonderful entertainment spaces. 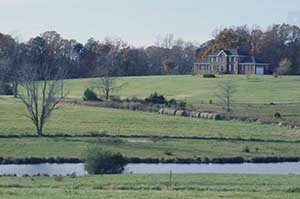 The Bransford Farm offers a beautiful farm setting with 235+/- acres, half in rolling fields, and a five-bedroom brick home overlooking a scenic pond. Several streams on the property. Located in Arvonia. 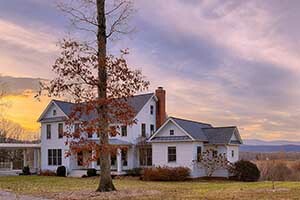 The Marshall Place, offers peace and privacy on 683+/- acres within an hour drive to Charlottesville and Richmond. 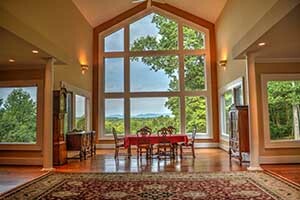 Stunning Blue Ridge Mountain views can be yours at this Madison County Modern Farm House on 62+/- acres. Wonderful kitchen, Gunite pool and raised vegetable beds are a few of its features. 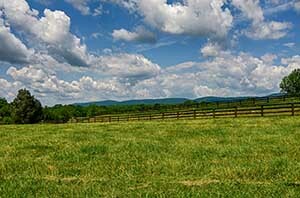 Located equidistant between Staunton and Harrisonburg is this beautiful horse and cattle farm on 192+/- acres. The spacious home offers one-floor living and a kitchen that will please any cook. 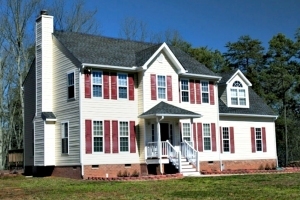 Beautiful five bedroom home on 3.4+/- acres located 10 minutes south of Charlottesville. 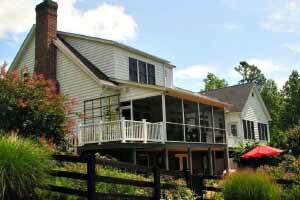 This South Fork Farms home has Blue Ridge Mountain views, entertainment spaces, two masterbedroom suites and a lovely saltwater pool. 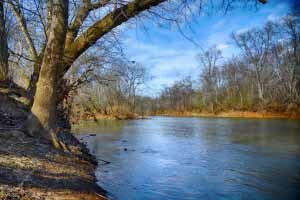 Virginia plantation of 489+/- acres with miles of Rivanna River frontage. Beautiful renovated home and extremely private but not remote. Lovely Free Union home on 4.7+/- acres with four bedrooms and 2.5 baths. Wonderful trails are nearby. Rare and affordable small parcel of 17 acres with Rapidan River frontage in the Graves Mill area of Madison County. 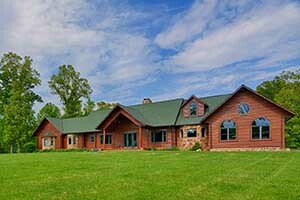 29+/- acres with division rights, frontage on Mechunk Creek and adjacent to several beautiful Keswick Estates. 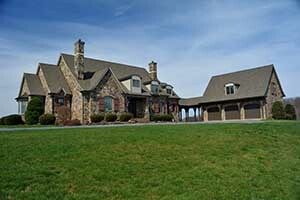 Perfect property for you to create your beautiful Virginia horse farm. 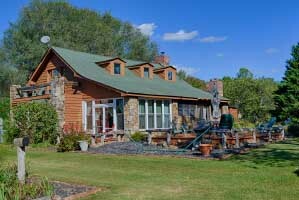 Extremely private, cypress log home overlooking the North Anna River on 182+/- acres located 35+/- minutes north of Charlottesville. Miles of groomed trails. A perfect place to get away from everything! 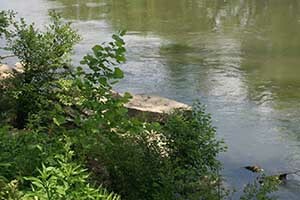 The Powell-McMullan House with frontage on the South River (stocked trout stream) in Greene County. 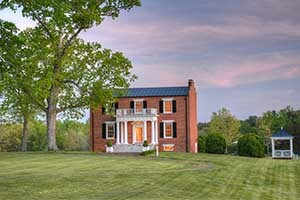 The home is on the National Register of Historic Places and the Virginia Landmarks Registry. Sold! 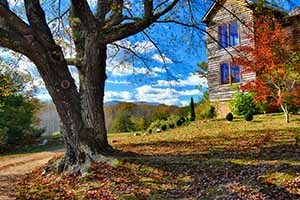 Oak Grove, circa 1854, has been authetically restored and sits gracefully atop its 131+/- acres in Fluvanna County. Lovely pool complex that is perfect for entertaining! 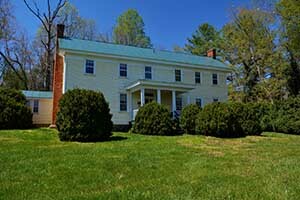 This is a beautiful country retreat with close proximity to Charlottesville, Richmond and Scottsville. Western Albemarle County Land perfect for your dream farm or estate on 55+/- acres along the Route 151 Wine and Brew Trail. 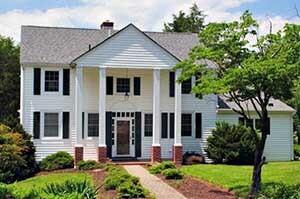 Conveniently located between Charlottesville and Staunton in a very private setting. 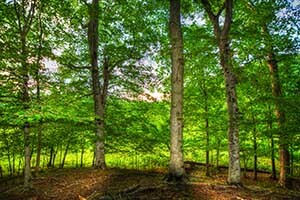 Twenty minutes from Charlottesville near the Keswick Hunt Country, you can find 307+/- acres at Cobham Forest. Quail Haven Farm, the location of several Civil War battles, offers a private retreat of 219+/- acres with Rappahannock River frontage in Culpeper County. 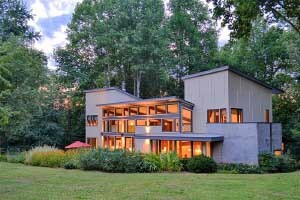 Beautiful contemporary home for sale in Nelson County, Virginia. Just 35 minutes south of Charlottesville. 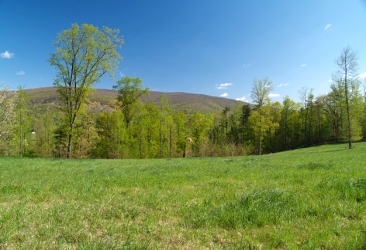 Beautiful 3-acre lot in the estate home development of Ragged Mountain Farms. 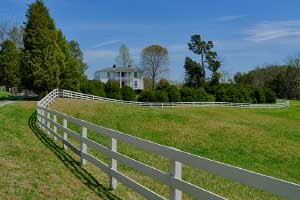 Overlooks a beautiful VA horse farm that is protected by a conservation easment. Sold! 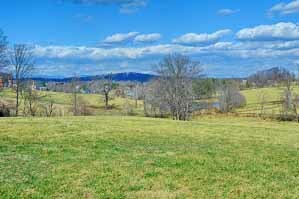 Build your Virginia farm on these 136+/- acres with frontage on the Rappahannock River. Comes with its own island and beautiful old Dutch barn! 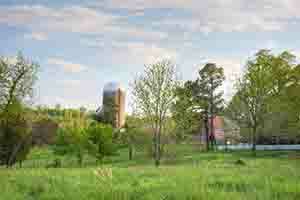 Approximately 70+/- acres are in open fields. Great recreational property too. The boyhood home of Earl Hamner, Jr., located in Schuyler was the inspiration for many stories, books and the TV Show "The Waltons". The Hamner Home has been beautifully restored. Four bedroom home. No HOA. Commute to Charlottesville or Richmond. 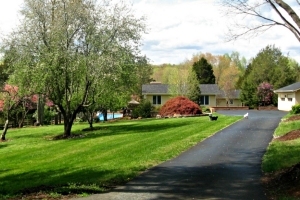 Luxury 3 home compound, with stable & pool on 8+/- acres, 5 min to Charlottesville. 307+/- acres at Cobham Forest near Keswick.